Description: 1060 Sq.Ft. 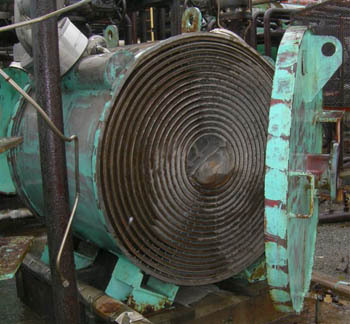 Spiral Heat Exchanger by American Heat Reclaiming. Material 316SS Tubes and Shell, One Head is CI and One is 316SS Lined. Pressure 100 Psi, Temperature 200 F. Tube Length 4'-9", Shell Nozzles (2) 6", Tube Nozzles (2) 6", Shell Diameter 4'-4", Shell Wall Thickness: .25"; Size: 4'4" O.D. X 4'9"; Heads: 2.75" Thick; Head Clamps In Metal Container; (Inner Pass) Cross Section .375" X 48"; Length 130.5'; Medium (Hot Side); (Outer Pass) Cross Section .5" X 48"; Length 134.4; Medium (Cold Side).